Preparations for the annual WEEE Week event start a long time before we even get to autumn. Whilst the sun is shining and children are enjoying their summer holidays, we at WEEE Man HQ are deciding which schools to target for WEEE Week that we run in October/November time. Our strategy is to target schools in the north, east, south, west and somewhere central to Lewisham in an attempt to engage and reach as many people as possible and so spread the educational message as well collecting as much Waste Electrical and Electronic Equipment as we can. WEEE Man and Kristina from our recycling team at Coopers Lane Primary School. With the Lewisham map spread out in a secret underground bunker (aka Wearside depot), and a team of generals assembled (the recycling team), we look at which schools we are going to target for our 2012 campaign. After much discussion and deliberation a shortlist of 5 schools is produced. We also draw up a reserve list in case the original 5 can’t accommodate us. With our 5 schools earmarked and our pins firmly stuck in the Lewisham map, it’s then a matter of contacting the schools through a series of emails and phone calls. Phone messages and emails are duly dispatched to all 5 schools and its then just a matter of waiting for the school summer holidays to finish. A Council Waste Prevention Officer from our recycling team shows the school assembly some examples of waste electrical and electronic equipment at St Augustine’s. Within a couple of weeks of the summer holidays finishing, follow up calls are made to the original 5 schools to secure their participation in this years event. Within the second week of chasing up the 5 original schools, two drop out straightaway as they are busy on the suggested dates – so we select others from our reserve list. 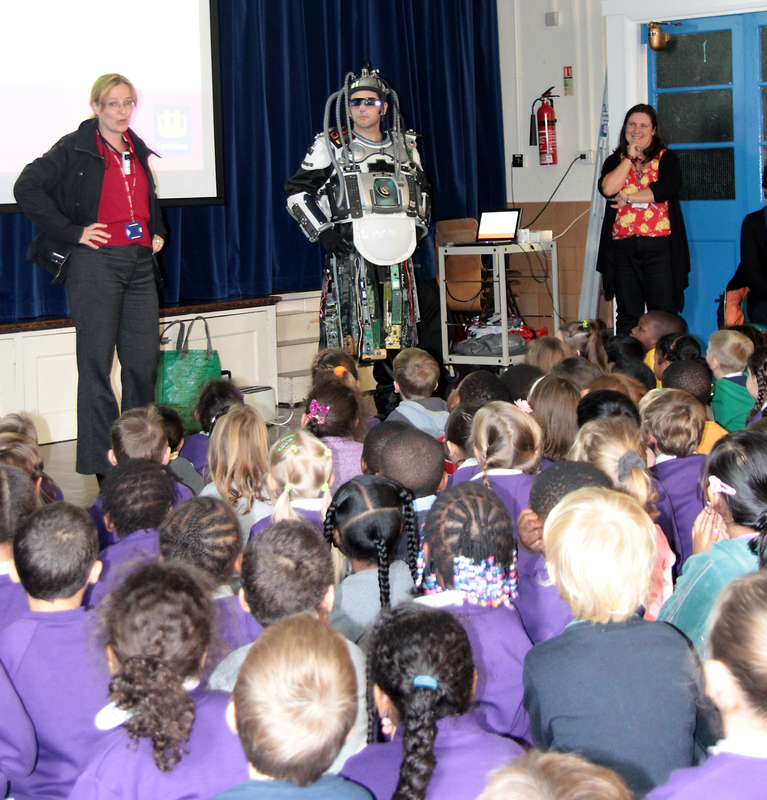 Typically a school’s involvement with WEEE Week starts with a visit by the recycling team and WEEE Man to conduct a school assembly. A member of the recycling team goes through a power point presentation with the children and shows them props (an old toaster, radio, hairdryer and an iron etc.) to demonstrate the sort of items that we are interested in collecting. 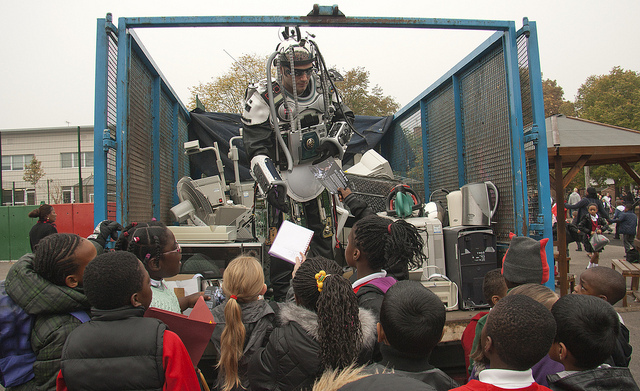 We then show the children a short film featuring WEEE Man coming back from the future Terminator style, bringing the message of recycling and how important it is to collect redundant electronic waste. When the film finishes, we ask the children if they liked WEEE Man which we usually receive a resounding YEESSSSS. We then ask them if they would like to meet WEEE Man to which we receive an even bigger resounding YEEESSSSSSSS!! Then, either from behind a curtain or from out of an old PE store cupboard, WEEE Man dramatically appears. The children as you can imagine get very excited to see him. WEEE Man is the strong silent moody type of Superhero and during his appearance he wanders among the children without uttering a single word. Any questions that the children have for him are answered by a member of the recycling team. Once a brief Q&A session has taken place, WEEE Man takes his leave and goes back from where he appeared from. After the assembly finishes, a few lucky children are chosen to stay behind for photographs with him. Even close up to WEEE Man the children are still in awe of him and are a little nervous of having their picture taken with him. 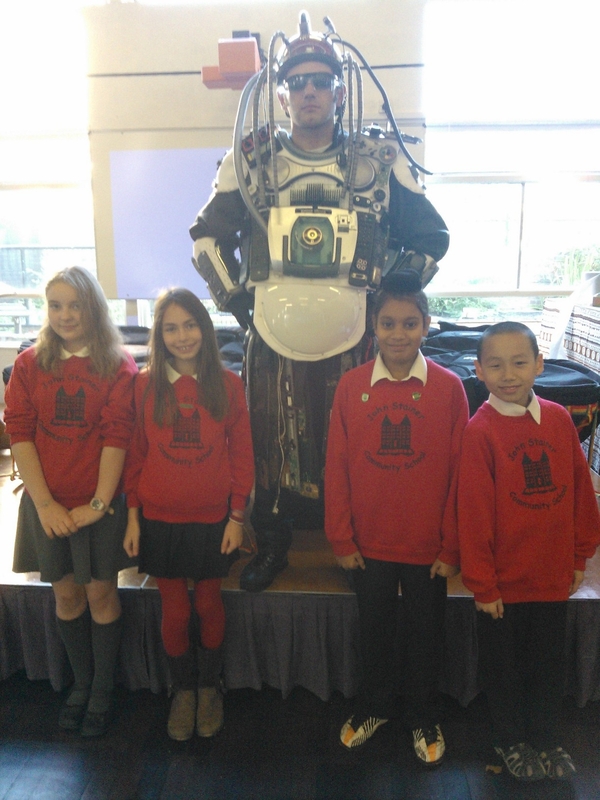 WEEE Man at John Stainer School. Before disappearing after the assemblies, we leave a few hundred flyers behind which the school distribute to the children via their book bag. The aim of the leaflet is to inform parents, carers, aunties, uncles, grandparents etc. of the forthcoming WEEE Week which takes place two weeks after the assemblies. We leave a week between collections and assemblies to give us more time to put further messages out on Twitter and deliver more leaflets in the local community. Then two weeks later we return to the school which a large collection vehicle, an A frame sign and start collecting all manner of electronics from school children, parents and teachers alike. This year we collected old video recorders, DVD players, clockwork radios and regular radios, lots of hairdryers and irons, a few toasters, a couple of food mixers, some speakers, some old CCTV equipment, amplifiers, a few laptops, lamps, bread makers, mobile phones, vacuum cleaners, microwave ovens, old computers, printers and an abundance of cables and plugs. We return with a truck and an A frame sign to collect all those unwanted electrical items. With regard to this years efforts, the recycling team would like to say a big thank you to the five schools that took part in the WEEE Week event and they were Tidemill Academy, Deptford, John Stainer school, Brockley, Adamsrill Primary school, Sydenham, Coopers Lane Primary school, Grove Park and St Augustine’s Catholic Primary school, Catford. 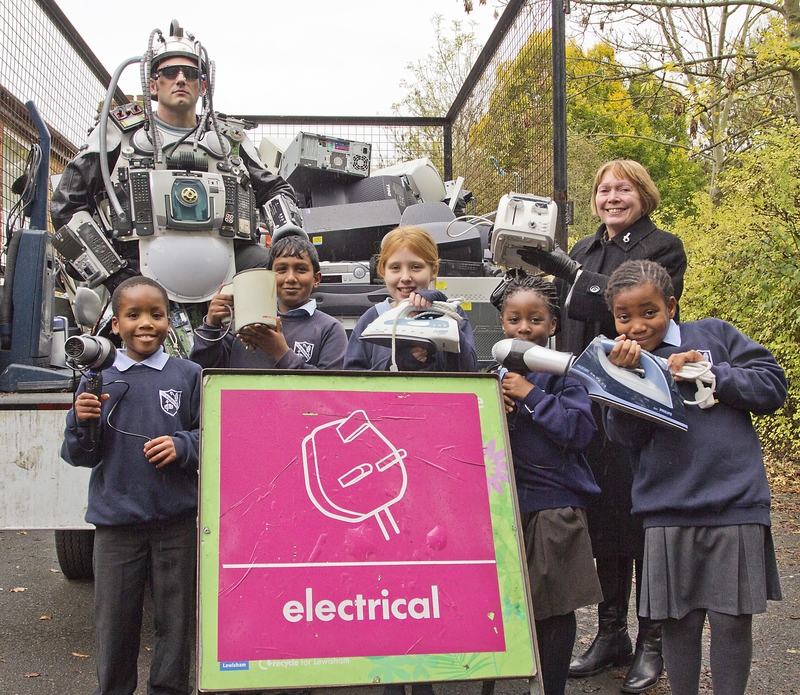 Through the partnership of Lewisham’s recycling team and the participating schools above, we managed to collect over a tonne of waste electrical and electronic equipment this year. Categories: community engagement, Environmental Campaigns, Schools, WEEE | Tags: Adamsrill Primary School, Coopers Lane Primary School, John Horabin, John Stainer Community Primary School, Repic, Small appliance collection during WEEE Week 2012, small appliances, St Augustine's Catholic Primary School, SWEEEP, Tidemill Academy, WEEE, WEEE man, WEEE waste, WEEE Week, WEEE Week 2012, WEEE Week collections | Permalink. WEEE Week ran from September 24th through to October 1st, 2011. In the build up to this event, Lewisham Council called upon the services of its new superhero WEEE Man, who came along to raise awareness and the profile of this type of waste. The Waste Electrical and Electronic Equipment Directive (WEEE Directive) was introduced into UK law in January 2007 by the Waste Electronic and Electrical Equipment Regulations 2006. It aims is to reduce the amount of electrical and electronic equipment being produced and to encourage everyone to reuse, recycle and recover it. With the help of WEEE Man, Lewisham Council set about taking the message of recycling WEEE waste to the people of Lewisham. 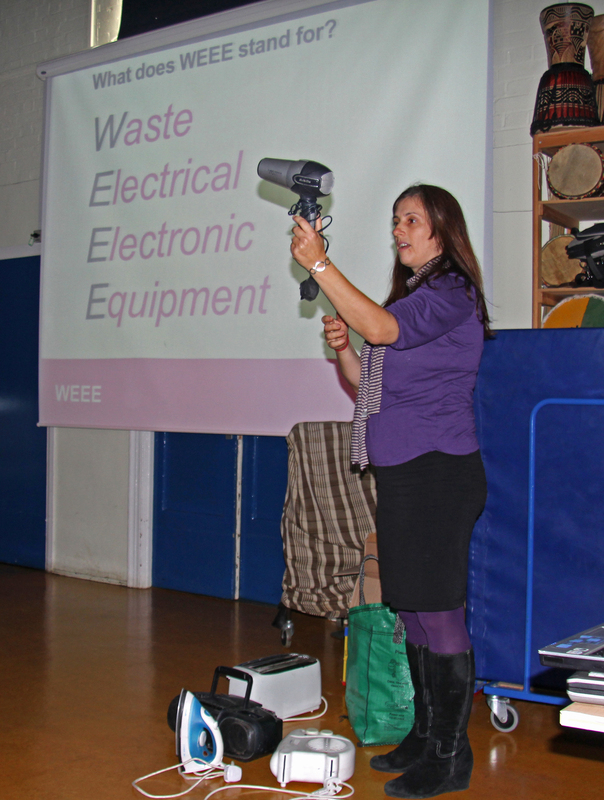 A couple of weeks before WEEE Week started, several schools were visited where a presentation was given to the assemblies about the issues surrounding electronic waste and how this could be recycled. The presentation informed the children about what WEEE waste was, and why it was important to recycle and dispose of this waste in the best way possible. This also included reusing any working items of electronic waste whenever possible. which they enjoyed very much before the actual man himself appeared to the very excited assemblies. He wandered amongst the excited children before making his exit and leaving behind flyers which the children were instructed to take home to their parents. The flyers carried all the information about the WEEE waste collections that were taking place at 6 schools. The schools that took place were Kelvin Grove, Sydenham, Forster Park, Catford, Ladywell Fields College, Ladywell, All Saints School, Blackheath, Sir Francis Drake, Deptford and Edmund Waller, New Cross. Two consecutive Saturday collections also took place at Dacres Road Nature Reserve. The collections saw lots of items being brought, from obsolete video recorders, defunct irons, hairdryers, and microwave ovens, through to redundant printers, scanners, old telephones, faxes, radios, stereos and even a hedge trimmer (see photo above). During the collection week, WEEE Man even decided to put in an appearance and was mobbed by children seeking autographs (see photo below). Two caged vehicles worth of WEEE waste was collected during the seven days that the collections ran for and a total of 1880kg of WEEE waste was collected. That’s nearly 2 tonnes! For those people that didn’t manage to drop off their old and unwanted items of WEEE waste, don’t forget that we still have 6 small appliance banks around the borough https://recycleforlewisham.com/2011/02/11/small-appliance-banks/ that can be used at any time. If you have items that are too big and not suitable for the small appliance banks, you can always take them to the Reuse and Recycle Centre at Landmann Way. Thank you to everyone that came along with your old toasters, kettles and radios etc and for making this event the success that it was. WEEE Man also called on the WEEE phone to say a big thank you to all the schools and the children for all their help and support. He will be more than happy to make return visits to schools and visit other schools in the future. Categories: Batteries, community engagement, Environmental Campaigns, recycling, reuse, Reuse and Recycling Centre, Schools, Uncategorized, waste minimisation, WEEE | Tags: All Saints School, Convoys Wharf, Dacres Road Nature Reserve, Dave Brinson, Edmund Waller School, Forster Park School, John Horabin, Kelvin School, Ladywell Fields College School, Landmann Way, Recycling, Repic, Sir Francis Drake School, Skatedog Productions, small appliance banks, Waste Electrical and Electronic Equipment, WEEE, WEEE Banks, WEEE man, WEEE waste, WEEE Week | Permalink. WEEE Man is here to save the World! For those that have been following us on Twitter and have seen our recent forays into the world of acting, film and promotional work, you should know all about the acronym WEEE. Below is a groundbreaking film about our very own WEEE superhero … WEEE Man. For those not entirely familiar with the jargon of the waste industry, WEEE actually stands for Waste Electrical and Electronic Equipment or put simply, that broken toaster, radio, lamp, kettle or hoover that’s been stuck at the back of your cupboard or in your garage for the last few months that you’ve been meaning to get rid of. 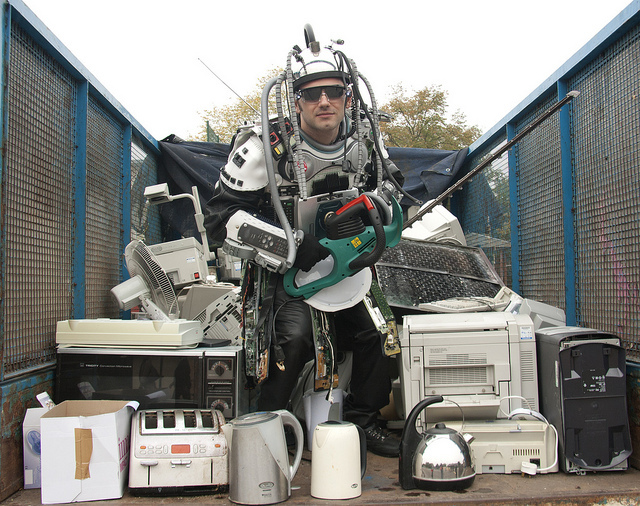 The Council are staging a week of WEEE collections during what we are calling, WEEE Week. This will be your opportunity to empty your cupboards of that unwanted electrical waste, those duplicate remote controls, hairdryers, food mixers, sandwich toasters, and redundant juicing machines. However, if you have items that are in perfect working order, why not see if someone would like it on Freecycle, or give it to a friend, neighbour or even a charity shop. Though if it is broken, then why not give it to us? During WEEE Week, a collection vehicle with be at one of the locations below between 8.30am and 12pm to collect your old and unwanted small electrical appliances. (1pm to 4pm at Sir Francis Drake and 1am to 3pm at Dacres Road). Please bring your old hoovers, radios, stereos, toasters, hairdryers, irons, microwaves, kettles, mobile phones, games consoles, computers and laptops to us for safe disposal. Please note: No TV’s, fridges or fluorescent tubes are allowed as these are considered hazardous waste which we cannot accept. Thursday 29th: All Saints Schools, Blackheath Vale, SE3 OTX, 8.30am – 12pm AND Sir Francis Drake School, Scawen Road, SE8 5AE, 1pm to 4pm. Categories: community engagement, Environmental Campaigns, recycling, reuse, Reuse and Recycling Centre, WEEE | Tags: brockley, Convoys Wharf, David Brinson, deptford, electronic waste, John Horabin, Lewisham Council, Recycling, Waste Electrical and Electronic Equiptment, WEEE, WEEE man | Permalink.